New year, new season — it’s an exciting time at Apache! We’ve begun to roll out new Spring Summer 2018 arrivals from some of our favourite brands, kicking off with SS18 menswear by Replay and Fred Perry. As always, we have followed three simple rules: decent value, quality construction, and a great vintage style. You can claim 10% off everything in this blog with a special offer code: SS18BLOG. 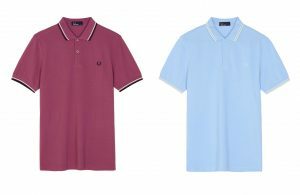 Fred Perry polo shirts are perhaps our most popular core garment. 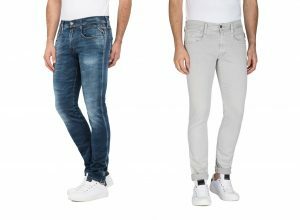 We have quite a few customers with ten or more of these in their wardrobe, and they often come into our shop to check out the new season M3600 colours. Our #SS18 menswear range has three new versions: 1969 Lilac (left), Sky Blue (right), and Calypso Coral. The secret to their popularity is the simplicity of the design — quality Pique cotton, vintage twin tipped cuffs and collar, and the timeless Fred Perry laurel wreath logo. 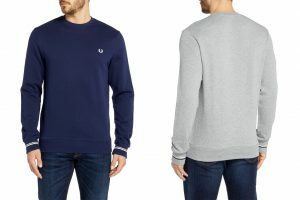 Check out these striking new sweatshirts by Fred Perry in Dark Night (left) and Vintage Marl Grey (right). The vintage sportswear design is nice and simple, and looks great with a pair of jeans for the classic “sports casual” look. Fred Perry use loopback cotton to prevent pilling (i.e. fluff from gathering on your T shirt), setting it apart from many other sweatshirts on the market. 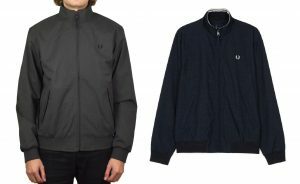 Here’s the first batch of outerwear in our SS18 menswear collection: an updated “marl” version of Fred Perry’s classic “Brentham” jacket. We’ve run the Brentham jacket for as long as we can remember — it’s our favourite bit of heritage outerwear. An ideal windbreaker, the jacket is both showerproof and mesh-lined. Available in Charcoal (left) and Navy (right). PreviousLyle and Scott SS18 Season is Here!